Lipo Light Pro is the very first 100% Non-Invasive Body Contouring System. 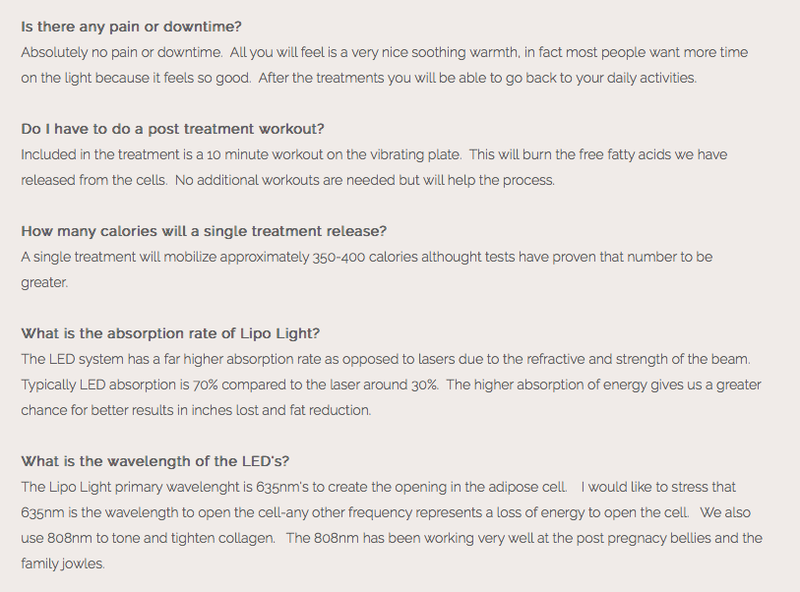 Lipo Light Pro was developed by a M.D. in 1998 and he was also the first to discover light therapy specifically for body sculpting. We use 16 paddles (vs 4-6 with other brand equipment) and each paddle has 30 medical grade LED lights that emit a warm red light. The paddles are placed directly on the skin for 20 minutes on the targeted areas. Areas may include the belly, love handles, inner thighs, arms, neck, face and back side. LOSE 1-3 INCHES PER SESSION!